These days, more and more Americans are taking their pets along on their summer travels. Here’s what you need to know to make it fun, safe and enjoyable for you and your pet. A little foresight and planning is essential for making the trip go smoothly. Check the pet policy everywhere you plan to stay. Make sure wherever you’re staying – whether in a motel, campsite or rental cabin – allows pets to stay with you. 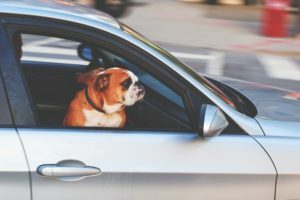 Many places do not allow pets, so calling ahead to verify will prevent last-minute scrambling to find a place that does after a long day of driving. Pack the right stuff. Bring food and water (and any medications your pet may be currently taking) from home to avoid digestive problems with your pet. Pack several of your pet’s favorite toys, as he or she will definitely want to play after being cooped up in the car for long periods of time. It’s also a good idea to pack a pet first aid kit – just in case. Have an up-to-date pet ID. This is especially important if you plan to camp or spend time in the great outdoors where pets can easily wander off and get lost. The identification tag should include your pet’s name and your contact number. On long trips, you may want to use a temporary ID that has contact information for where you will be staying. Prepare your pet for riding in the car. Most dogs enjoy riding in the car. Cats and other animals may need to be gradually acclimated to the noise and motion. If you can, exercise your pet just before hitting the road. A tired pet is more likely to sleep and be less restless in the car. Always buckle up your pet. An unrestrained pet can distract the driver and even cause an auto collision. Using a harness, pet seat or some other type of barrier will make the trip safer for you and your pet. Travel on an empty stomach. This means your pet, not you. Riding on a full stomach can make your pet more susceptible to car sickness. On a long trip, it’s okay to feed your pet a small amount of food two hours before you set sail. 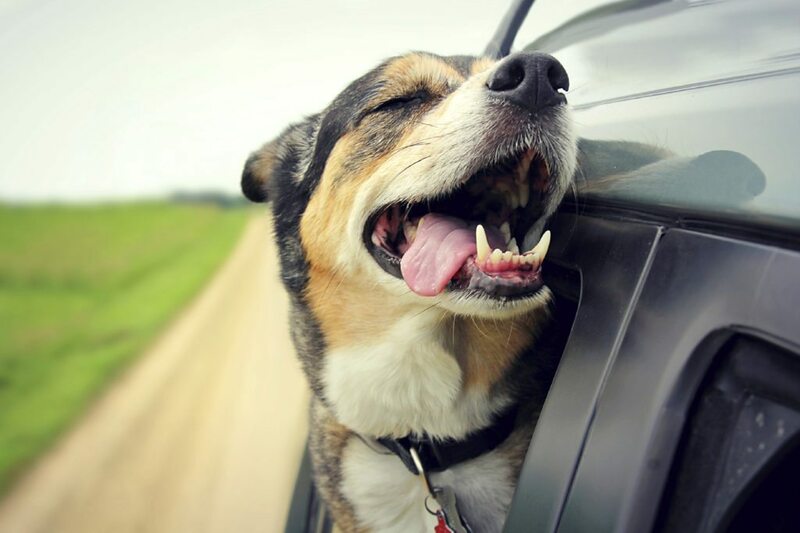 If your pet is prone to car sickness, ask your vet for some medication in advance. Take plenty of stretch breaks. People need to stretch their legs on long trips and so do animals. Keep your pet on a leash to avoid wandering off or getting into conflict with other animals in the area. Protect your car seats. You may want to install car seat covers before your trip, especially if you have a long-haired pet. This will help keep dirt, mud and pet hair from ruining the upholstery or requiring an expensive cleaning bill. At the campsite. Keep your pet on a leash at all times to prevent wandering off. In “snaky” surroundings, don’t let them dash off into the underbrush, even with a leash on. Provide plenty of shade and water for your pet, especially during the hottest mid-day hours. Be sure to use doggie bags to clean up after your pet, and dispose of them properly. At the hotel. Avoid leaving your pet alone in your hotel room. If room service were to enter, it could frighten your pet and the maid. If you must leave your pet alone, place him or her in a doggie crate or post the “do not disturb” placard on your door. Anywhere. Never leave your dog in a hot car, even with the windows open. The temperature inside a car can increase surprisingly fast, and most pets can’t control their body temperature as efficiently as people. Bringing the pet along on your summer vacation can be fun for the whole family as long as you follow these guidelines. Be extra patient with your pet in places that are unfamiliar to them. Keep them clean and well-groomed during the trip. Give them plenty of exercise, and keep them out of harm’s way. Happy travels!